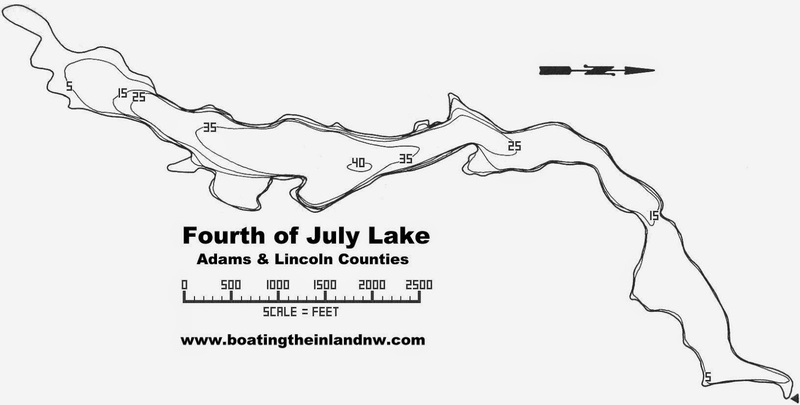 Fourth of July Lake in Lincoln County Washington is a long and narrow desert lake set in a canyon with steep basalt cliffs and steep slopes around it. The primitive launch is gravel/rocky with a short road that goes from the launch to a gravel parking area. The launch is on the northeast end of the lake. There are no facilities at this site and camping or overnight parking is not allowed. This is cattle country so watch your step for those wonderful cow pies. Fishing: Black Crappie, Catfish, Largemouth Bass, Rainbow Trout, Spiny Ray, Yellow Perch. Lake Dimensions & Coordinates: 110 acres; Maximum depth estimated at 45 ft; elevation 1891 ft; Coordinates T20N R38E Sec 1, 11, 12. & T21N R38E Sec 35, 36. Longitude 117d 57m 59s -to- 117d 58m 57s west. Latitude 47d 14m 45s -to- 47d 16m 8s N. Directions: Take exit 245 off of HWY 95 and turn south on HWY 23 about a mile and a half and on your right you will see a gravel road. Take this gravel road about a mile to lake. NOTICE: This lake is a winter fishery only so the gate to the lake may be lock and so accessing this lake during the summer is only possible by carrying your small craft around the gate. ACCESSIBILITY: PARKING... Gravel and dirt parking area near launch; PATHS/TRAILS... None. Any trails are sandy and rocky; RESTROOMS/FACILITIES… None; SENSORY... No sensory tactile markers for those with visual and other impairments. DOCKS/LAUNCHES/PLATFORMS… No dock, One muddy/rocky primitive launch; DIRECT WATER ACCESS… No access for wheeled mobility devices; TRANSFER SYSTEMS... None; CAMPING... Not allowed; O.T.H.E.R… Oddities/Barriers: Nothing unusual. Lots of cow dung; Terrain: Level to about 5% grade descending into the water. 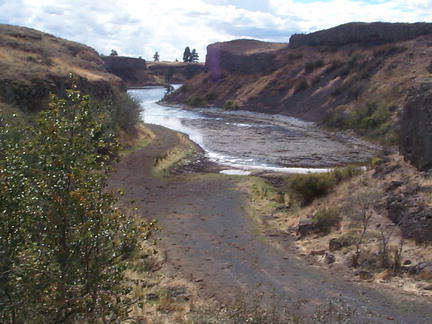 Lots of sand, rocks, mud, and some cow dung at different areas around the lake; Environmental Conditions: Windy and Hot during the summer; Resources: Food, drinks, and gas at town of Sprague off of I90. Rama Thapa, September 30, 2018 at 8:01 PM: Very nice blog and great information.